Quadruplet brothers in Ohio have all been accepted at some of the nation's top universities, including each of them to both Yale and Harvard. The Wade brothers of the northern Cincinnati suburb of Liberty Township say they have been notified in recent days of acceptances from a number of notable schools. 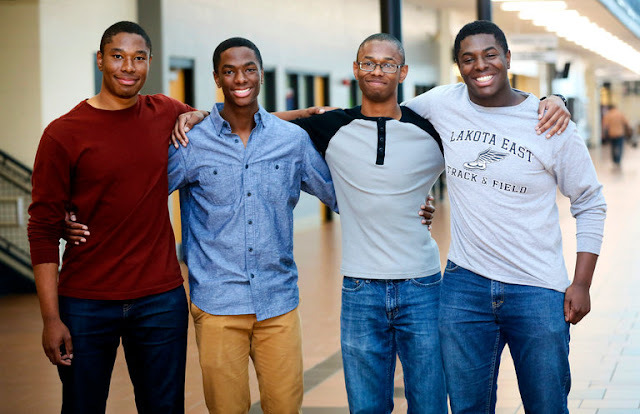 Lakota East High School principal Suzanna Davis tells the Hamilton-Middletown Journal-News that the four seniors epitomize academic focus but are well-rounded, "great young men" with individual personalities. Aaron, Nick, Nigel and Zachary haven't made their decisions, though Aaron likes Stanford University and his three brothers are leaning toward Yale. Financial aid offers likely will play an important role. "It's really something we couldn't have done on our own without all the support we have had through our lives," Nick said. "It has been awesome." "We feel like getting into these schools show who the people around us are," Nigel said. Zachary added that they have always gotten encouragement that "the sky's the limit" with their hard work. "We were never told that we couldn't get somewhere," Zachary said. The Washington Post reports that Harvard doesn't comment on admission statuses and that Yale said by policy, it doesn't discuss admitted students. Quick, professional and affordable repair. Pièces iPhone 5 screen shattered and they replaced it the same day. Even though they were busy, the work only took some time to repair. Great customer service. Great price, totally awesome service and repair…..